Delta<sup></sup>'s separate rough and trim program allows you to switch your trim without the hassle of changing your rough-in as well. Another great benefit is the ability to have your plumber install the rough-in before you've decided on the trim you want. By installing the rough-in first, you can later decide what type of trim will go perfectly in your bath. With separate handles for volume and temperature control, this Delta tub/shower provides a more refined showering experience. Simply set the water at your preferred temperature and turn the shower on or off with the volume control handle - without interrupting your set temperature. While other products may gather unsightly mineral build-up over time, Delta soft rubber Touch-Clean spray holes allow any mineral residue to simply be wiped away for an instantly refreshed look with no need for soaking or the aid of chemical cleaners. Delta pressure-balance valves use Monitor Technology to protect you and your family from sudden temperature changes. Chrome has rapidly become one of the most popular finishes across décor styles in the bath thanks to its stunning gloss and innate versatility. Paired with crisp lines and bright whites, it creates a bold, modern contrast, but it works equally well with vintage styles and traditional spaces to convey a hint of nostalgia. Inspired by the sleek elegance of modern European design, the Trinsic. Bath Collection completes the look of any contemporary bath, from classic to rustic. With separate handles for volume and temperature control, this Delta tub/shower provides a more refined showering experience. Simply set the water at your preferred temperature and turn the shower on or off with the volume control handle - without interrupting your set temperature. Delta. pressure-balance valves use Monitor. Technology to protect you and your family from sudden temperature changes. Matte Black makes a statement in your space, cultivating a sophisticated air and coordinating flawlessly with most other fixtures and accents. With bright tones, Matte Black is undeniably modern with a strong contrast, but it can complement traditional or transitional spaces just as well when paired against warm nuetrals for a rustic feel akin to cast iron. Grohsafe Universal Pressure Balance Rough-In valve. By combining superior technology with a choice of breath-taking designs, GROHE can provide you with all the elements to enhance your bathing space. GROHE's fittings unite a beautifully elegant appearance that can work in a full range of design schemes from traditional to modern with quality materials, German craftsmanship and superior innovation for long-lasting performance. The impressive portfolio of products that not only dial up the design quotient, but also leverage technology in clever ways to yield smart and sophisticated homes. Ultimate enjoyment. Unrivaled performance. Enjoy taking a refreshing shower more than ever before with the GrohTherm 1000 thermostat. Offering optimal ergonomics and the highest safety standards in its market segment, it's the ideal thermostat for every kind of user, from children to seniors. The contemporary design and extended range of products means there's a perfect solution for every bathroom and every situation, whether a renovation or new build, behind or in front of the wall, a single private residence or extensive commercial project. 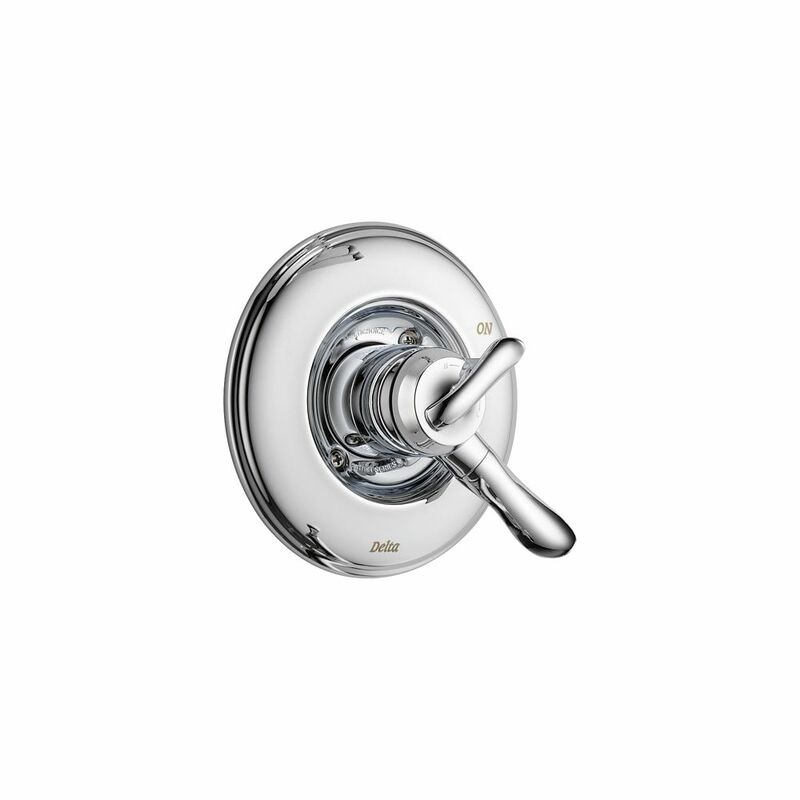 Offered in GROHE StarLight Chrome finish for scratch and tarnish-resistant surfaces for a lifetime of beauty. Linden Monitor 17 Series Valve Only, Chrome Delta<sup></sup>'s separate rough and trim program allows you to switch your trim without the hassle of changing your rough-in as well. Another great benefit is the ability to have your plumber install the rough-in before you've decided on the trim you want. By installing the rough-in first, you can later decide what type of trim will go perfectly in your bath. Linden Monitor 17 Series Valve Only, Chrome is rated 4.4 out of 5 by 25. Rated 5 out of 5 by T e d from Love this shower Great look and works great too. Rated 5 out of 5 by tc24da from This item was very easy to install. It sure beats the one that I replaced. The new one has 2 ha... This item was very easy to install. It sure beats the one that I replaced. The new one has 2 handles whereas the old one had one handle. Rated 5 out of 5 by MissDIY from love this! I love the ability to control the temperature the temperature and water flow separately. The install was fast and easy. It is easy to turn on and off. Rated 5 out of 5 by SA from Beautiful!... Beautiful! Rated 4 out of 5 by Handyman from Replaced a first generation Monitor trim kit. Had to use a new valve, Model# RP32104 to make it w... Replaced a first generation Monitor trim kit. Had to use a new valve, Model# RP32104 to make it work. Rated 4 out of 5 by HomeDepotCustomer from Wish the small temp handle wasn’t plastic. ... Wish the small temp handle wasn’t plastic.